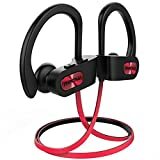 Last week we told you about a fantastic sale on Amazon that slashed the price of the Mpow Flame Bluetooth Headphones all the way to just $19.99. These wireless earbuds are best-sellers on Amazon, so thousands of our readers jumped at the opportunity to get them for a penny under $20. Well, we have good news if you missed them last week: they’re still on sale right now! We’re not sure when this deal is going to end, so grab a pair soon if you don’t want to miss out. 1.5-HOUR QUICK CHARGE FOR 7-9 HOURS PLAYING: Improved lithium polymer battery brings up to 7-9 hours pleasure musically and socially with a quick charge of only 1.5 hours. It will show the remaining battery power of the headphones on the iOS Phone screen. Note: 1. Mpow Flame has 12V over-voltage hardware cut off, 1A over-current restored fuse to achieve safe charging. 2. Please use charging cable provided, or certified brand charging cable. 3. We don’t recommend using fast charging.